This year was the 4th year Run Norwich has taken place, the 4th year I’ve run it, and my slowest one yet. Year one was pretty good, year 2 I went too fast for the heat, had a meltdown and limped in the last 2 miles, year 3 I went slow and steady. 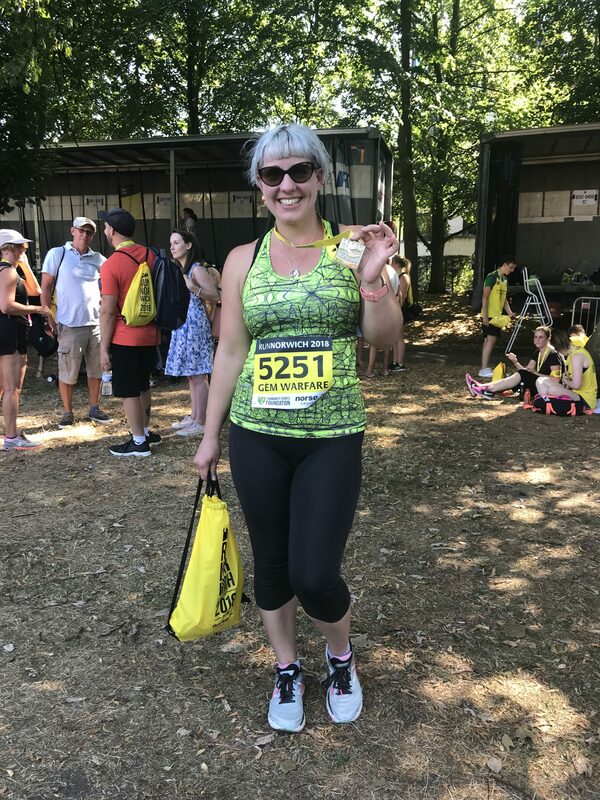 Year 4 will be remembered as the year a 10k made me cry. I was doing pretty well training in early July. Then came the absurd heatwave and it all went to hell. We arrived later this year, around 9am, and the race start was packed. 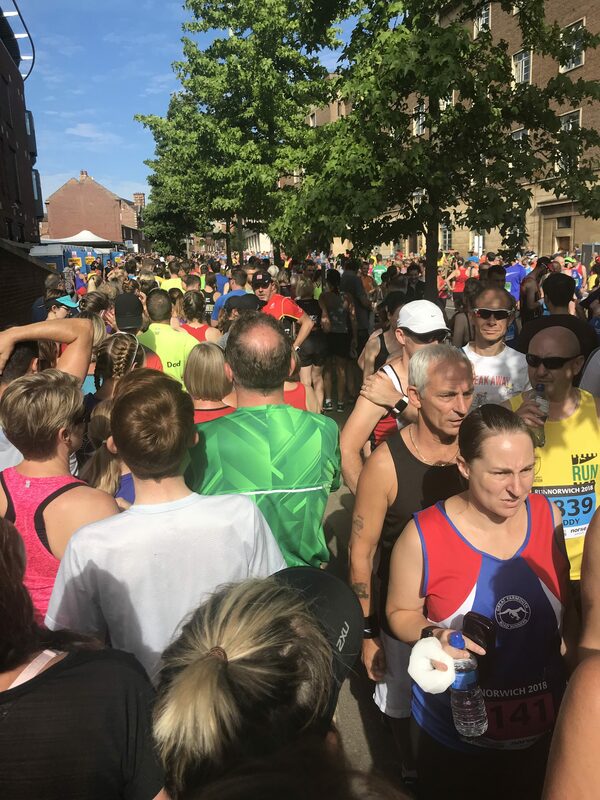 There were 7000 places available for Run Norwich in 2018 and I think all of them were queuing for a last minute wee. 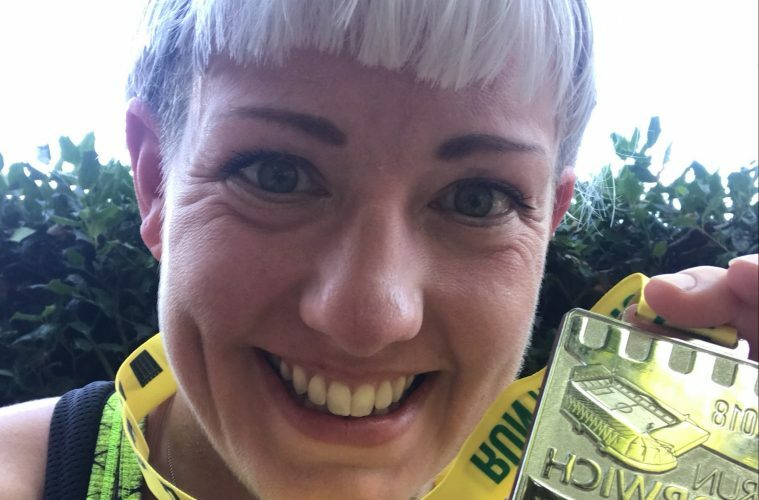 I was feeling a little anxious as 9:30 approached, still stuck in a toilet queue and talking to another girl who was telling me about all her training in the hot weather and how was she was targeting 9:30 minute miles just made me feel SUPER confident. SUPER. I made it into the start pen just before the starting whistle and even had time to pose for a photo so that later on I could remember how fresh and optimistic I was at this point. As ever, the atmosphere on the Run Norwich route was amazing. There is music on most of the route, including live cheering and songs from Rock Choir. 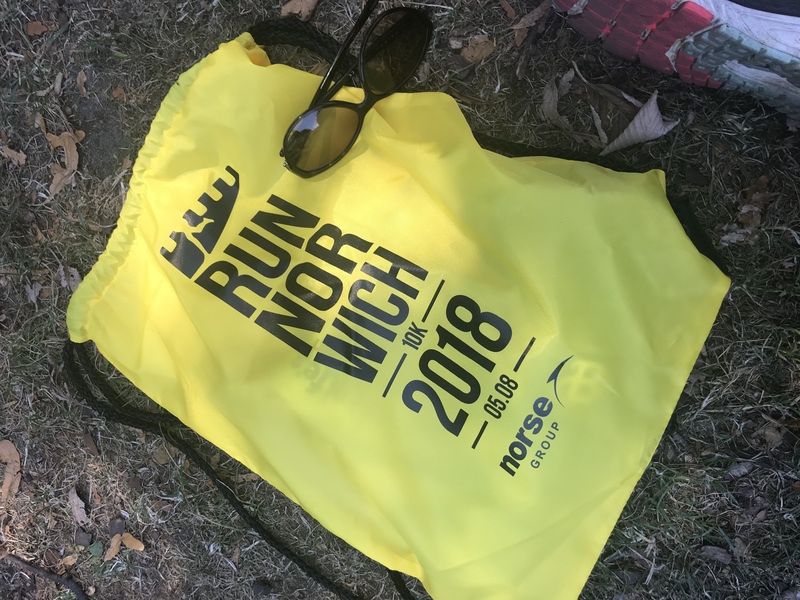 It seems like most of the people in Norwich who aren’t running come out to line the route, there were people with signs, people handing out jelly babies and water and mostly lots of cheering, which really does help. The atmosphere in my head, however, was less good. I tried to stick to the shade wherever I could, but within 2 miles I felt a bit like my brain was too big for my skull. 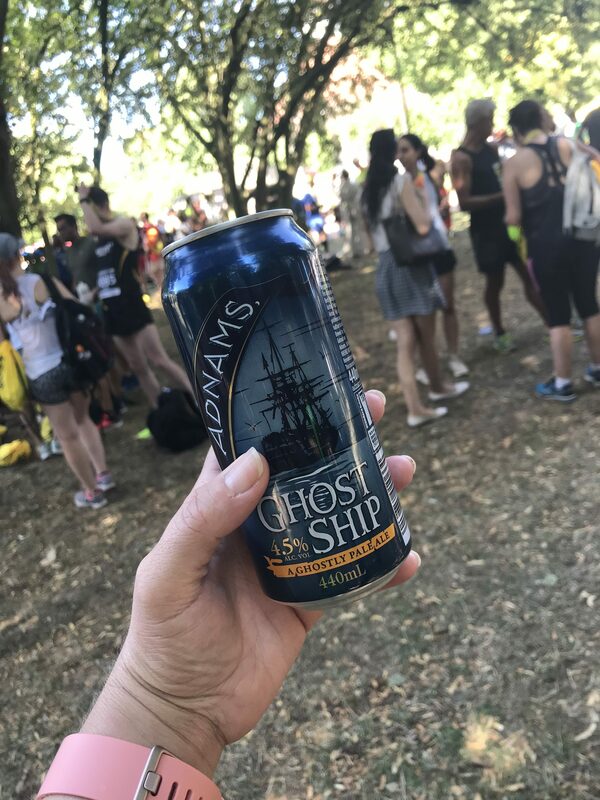 I was carrying water, but I still stopped and drank 2 cups at the water station at 4k, and I also walked back and forwards through the water misters several times. At Rose Lane you have the first real hill of the course, and despite my good intentions I managed about 4 strides before I slowed to a trudge. There were very few cheers on Rose Lane either, which was a shame, as I could have done with some encouragement at that point! On the other side I made the most of the downhill on Prince of Wales Road to pick up a very small amount of speed, that and there is NO SHADE and I wanted to get it over and done with. My highlight of the run happened around 7k when a man appeared on his doorstep with a Pug and began acting out the scene from the beginning of the Lion King. That made me laugh so hard I forgot to breathe. I did avoid a 2016 style meltdown, but I can promise you I was struggling badly by the end of the course. At 8k I looked at my watch and realised I was potentially on for finishing in over an hour and 10 minutes, the slowest I have ever run a 10k and I actually felt myself choking back tears. Look, I was very hot, ok! I took another little walk break on an uphill at Castle Meadow, but as time ticked away I was determined to finish in under an hour and 10 minutes, and I made myself run the whole last kilometre, including that final stupid hill up Rampant Horse Street (still my favourite road name). All the while thinking I would never sign up for Run Norwich again. So yeah, I finished, in 1 hour and 9 minutes and 9 seconds. It’s not a time I’m proud of, and I’m also not proud of the fact that I sat on the floor in the Race Village afterwards and cried. I cried because I know I can do better and I felt I’d let myself down, I cried because I was very, very, hot. I cried because it was really hard and I felt like my slowest 10k ever shouldn’t have also been my hardest. I cried because Mr LLL had a great race and I was annoying and whingy and not helping him celebrate his achievements. Then I cooled down a bit and drank my free beer and gradually I started to feel a little better. A bad race time in 28-degree heat when you really haven’t trained for either the distance or the weather really isn’t the end of the world. I told myself to get a grip and I remembered doing hand slaps with old ladies and small children in the last kilometre. I remembered the people leaning out of their windows cheering the runners on. 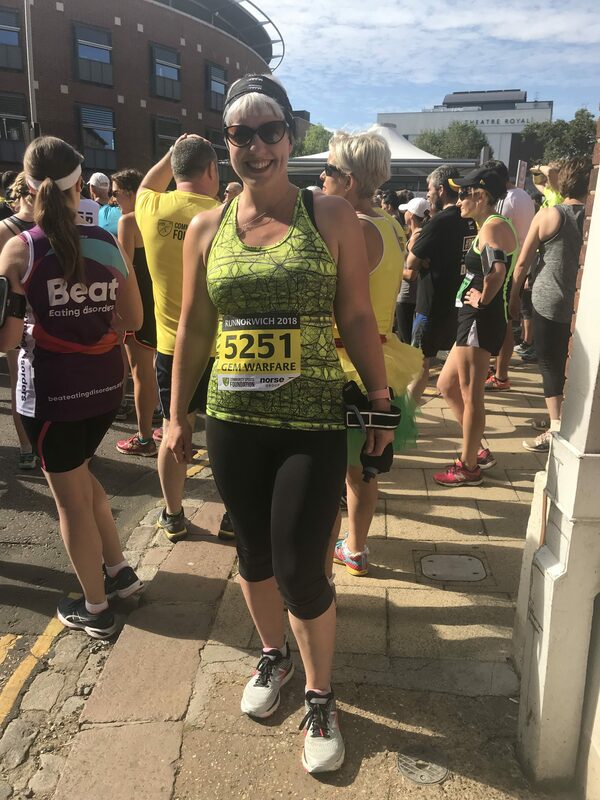 I remembered the guy with the Pug and I giggled a bit, and then I chalked the whole thing up to experience, went and had a coffee and added another medal to my collection and thought that maybe, actually, I could do another Run Norwich next year.